You are currently browsing the category archive for the ‘Napa’ category. 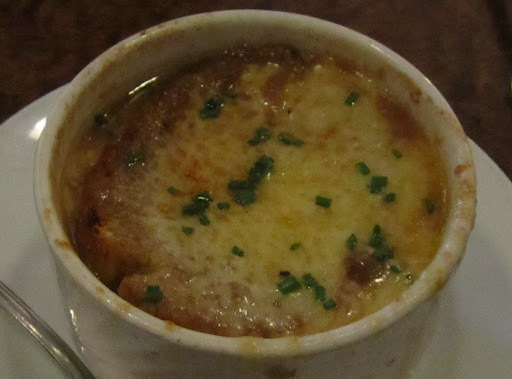 When a place is recommended by both a French concierge and a local, it is a must for a meal in my book. The view alone at Auberge Du Soleil is worth the trip. You can come just to take pictures on the terrace, but I recommend that you make a reservation for dinner and try at least the 3 course meal ($98) or the tasting menu of 6 courses ($150). 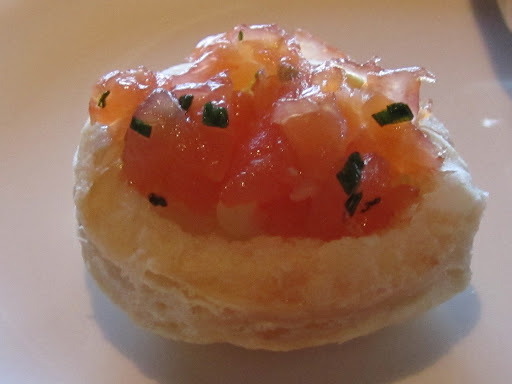 The meal begins with an amuse guele of salmon with creme fraiche on a puff pastry shell. A very delicate way to start a meal. 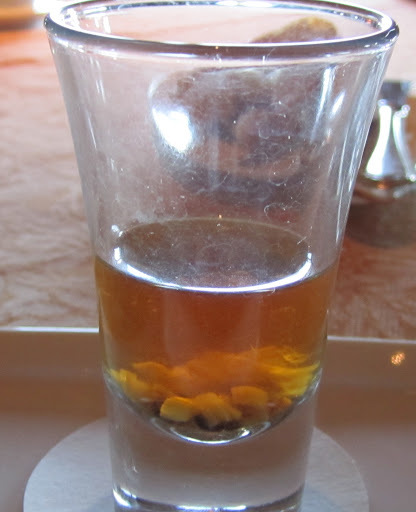 To begin, we were offered a nice shot of consomme with quinoa. This was so good, I forgot to take a picture until I had already drunk half of it! 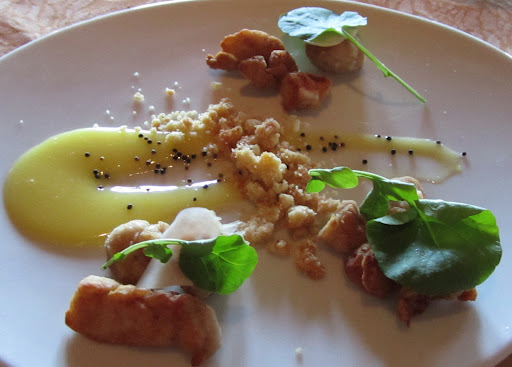 I started with the veal sweetbreads with lemon curd,black pepper, poppy, and watercress. It was a picture perfect plate, with pitch perfect flavors. Kampachi crudo, avocado, radish, cucumbers, and shitake vinaigrette was a fresh way to offer sashimi, and the fried sliver of garlic on top added a nice cooked crunch to the raw ingredients. 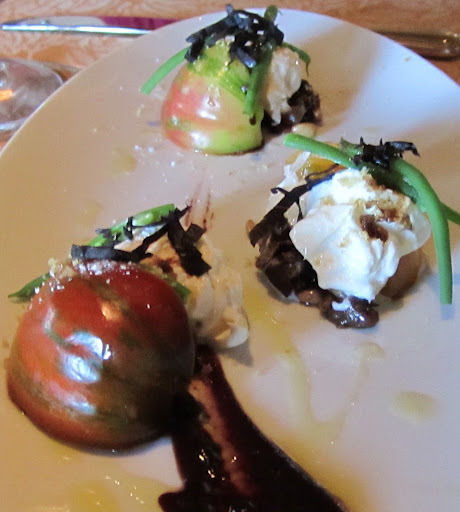 Heirloom tomatoes with cow’s milk ricotta, caponata, pine nuts, and black olive caramel was a twisted version of the classic. The perfectly ripe tomatoes and the use of riccota instead of burrata gave this starter an unexpectedly original flavor. The Day boat scallop, saffron potato puree, Monterey Bay squid, hijiki, and salmon roe was an exquisite expression of rich, complex sea flavors. 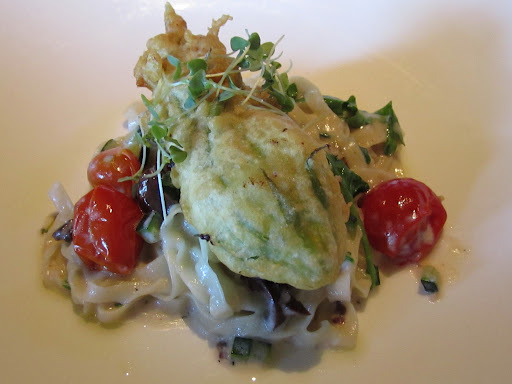 Handmade tagliatelle pasta, with a ricotta stuffed squash blossom, oven roasted tomatoes and Nicoise olives was the perfect meal for the athlete in our group who was set to go on a 14 mile run the next morning. She enjoyed the combination of vegetables and pasta so much she literally cleaned the plate. 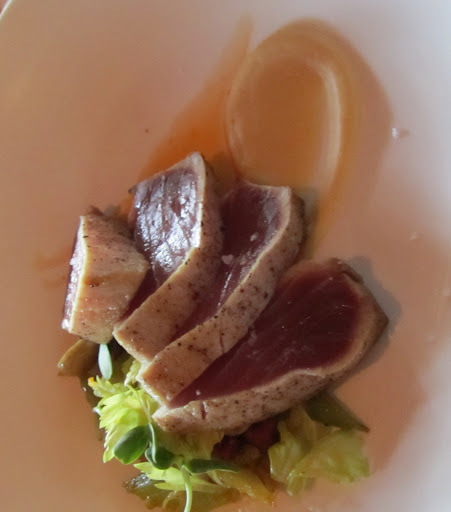 The seared Ahi tuna, hummus, celery, sunflower sprouts, chorizo, and pine nuts was sashimi quality fish, done with light accompaniments which enhanced the fish in both textures and tastes. 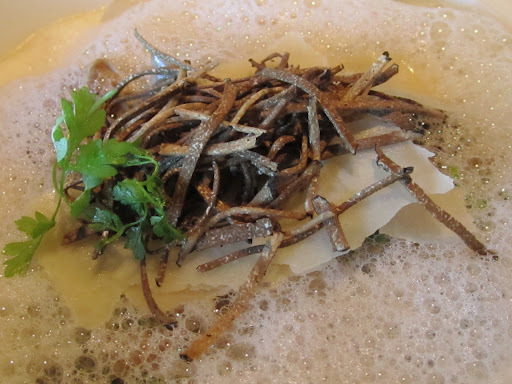 When I saw the spiced Paine Farm squab, buttermilk, grilled little gem, fried flatbread, and black garlic vinaigrette on the menu, I knew what my main course was going to be and I was not disappointed when my meal arrived. 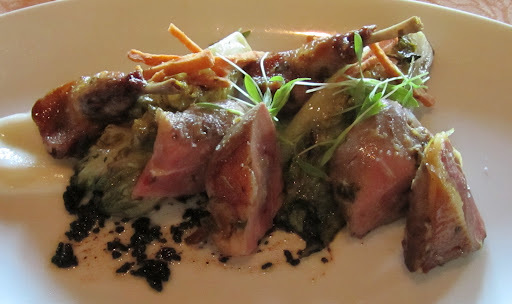 The squab was done rare and was perfectly paired with the black garlic and grilled little gem lettuce. 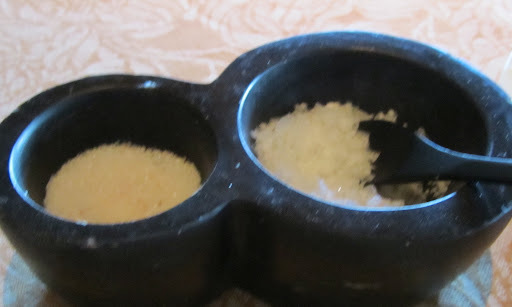 Pink sea salt and Maldon salt was served on the side of the squab (I used the Maldon salt) in case the squab was not seasoned to taste. The least adventurous eater in our group took my suggestion to order the sauteed Tai snapper, glazed pork belly, braised vegetables, scallion tempura, Thai broth. It was a hit, especially once the server poured the Thai brother into the bowl. 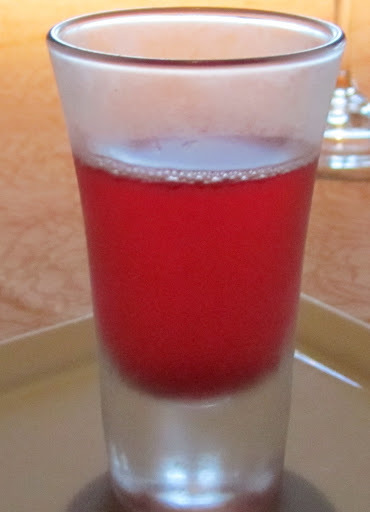 A refreshing palate cleanser of watermelon and strawberry arrived before dessert. 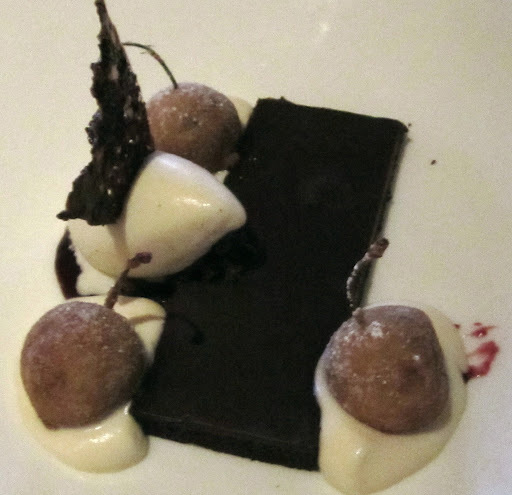 The chocolate cherry fritters, Kirsch sabayon, chocolate one layer cake, and cocoa nibs was a brilliant take on the classic chocolate covered cherries. It literally turned the dessert inside out and then added chocolate cake and ice cream. Yes, this tasted as good as it sounds! I was pleasantly surprised to learn I didn’t have to choose between the cheeses offered, but I could get ALL of them! Served with fresh figs, dried apricots, sliced apples, and champagne grapes, the assortment of cow, goat and blue cheeses was the perfect third course for me. Even though a small sliced loaf of bread was offered I never touched it (other than to open the napkin covering it to see what was inside). 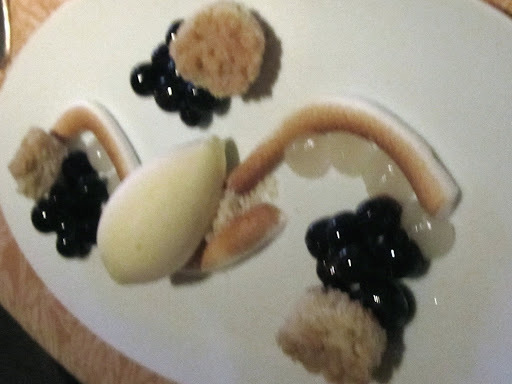 Delta blueberries, vanilla streusel cake, lemon verbana ice cream, and soft meringue was a light dessert for those who want just a few bites of various textures. Crisp filo wrapped chocolate dumplings, tarragon ice cream, and Arbequina olive oil made the plate look like a work of art. Unfortunately the olive oil was much prettier to look at than to eat with this dessert. As an after dinner temptation, we were given a plate of French truffles, salted caramels, and cocoa covered almonds, which we somehow ate even after finishing three courses. As an additional gift to take home, we were each presented with a box of pate des fruits which were concentrated explosions of fruit. I could easily eat several boxes of these! Service was classically French, with proper silverware (fish knife for fish courses), and expert explanations of every dish. The meal was well worth the price paid, but the company of good friends was priceless. Even though I have been to Napa numerous times and I have toured countless wineries, I had never been to Beringer until this trip. I’m so glad that I finally toured the estate with people who had never been to Napa. 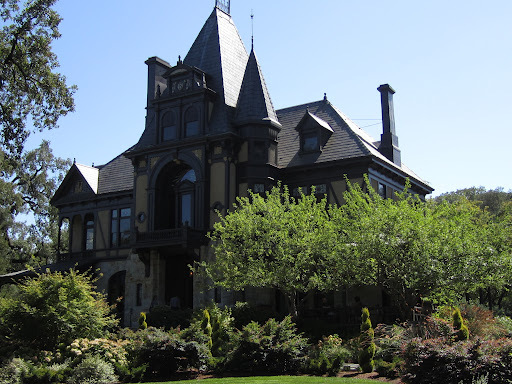 Just like the Empire State building, Beringer is one of those places that everyone knows about, but locals rarely revisit (even though I’m no longer a local). Dug by hand eight stories underground, the caves are now reinforced with steel and concrete for stability, but the age old wisdom of temperature control underground is a natural solution to the summer temperatures of over 90 degrees in the Summer (it was 94F when we were on the tour). 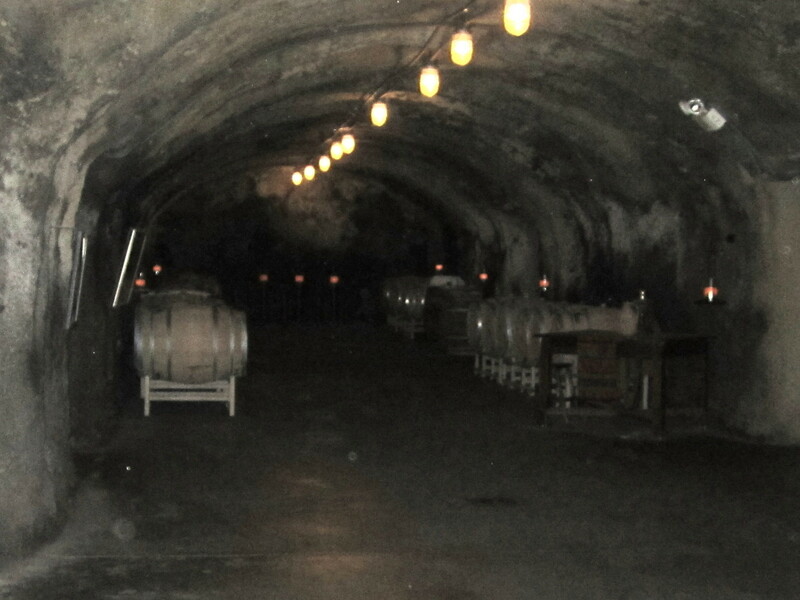 Take the tour of the caves and see how they did things before electricity (and refrigeration)! 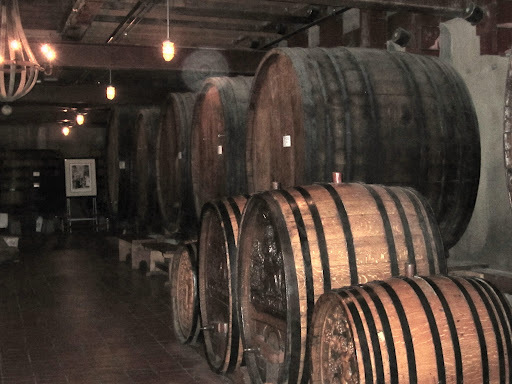 The barrels are from before prohibition, and the way the caves were built was an ingenious solution to the logistics of pressing grapes and keeping the temperatures cool. 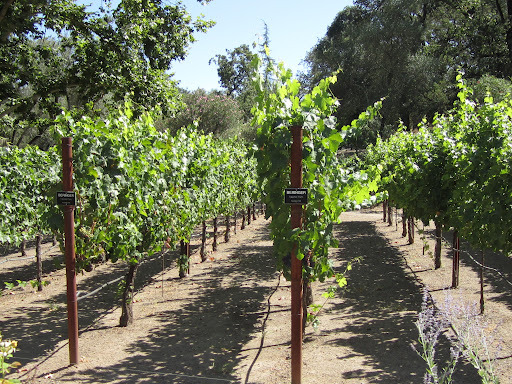 The grounds include working vineyards and each of the rows of vines is labeled with the variety of grape. The Rhine House at the entrance is the original home of the Beringer family and some of the woodwork and stained glass are original parts of the house (now a gift shop). 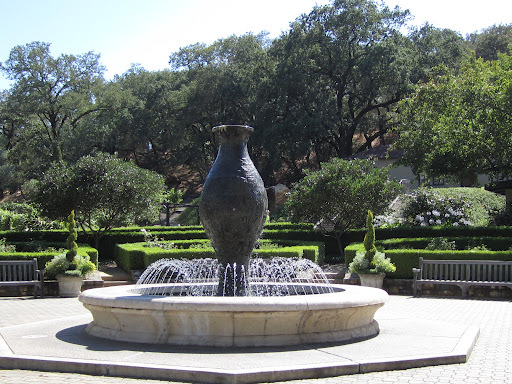 The gardens are spectacular, with huge trees, bushes, and flowers, all perfectly arranged in a kaleidoscope of colors around the manicured lawn, but my favorite was the fountain which offered a refreshing respite of soothing sounds and a vision of relief from the hot sun to visitors. Finding enough babysitters for 6 children is a challenge; if by some miracle of planning, or an excellent organizer (like Audrey), this actually occurs, then coordinating a dinner for 11 at a restaurant everyone will enjoy is a miracle. After a miraculous dinner at Bistro Don Giovanni, I now know miracles do occur! 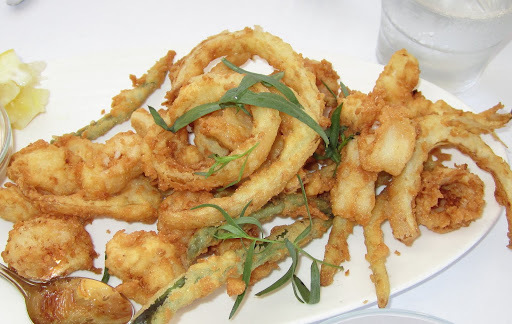 We started with an appetizer of fritto misto, with calamari, rock shrimp, fennel, summer beans and aioli for $14. This was devoured by the table and we could have easily eaten another if we did not order main courses. 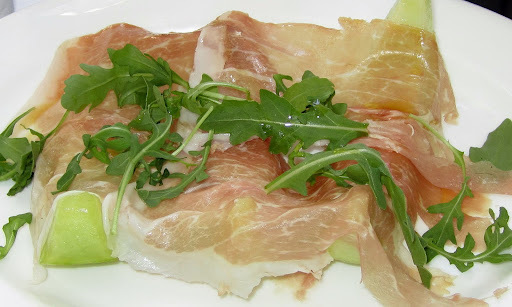 The table also shared this delectable proscuitto and melon for $13 that was exactly as it should have been, with paper thin slices of proscuitto and ripe melon. 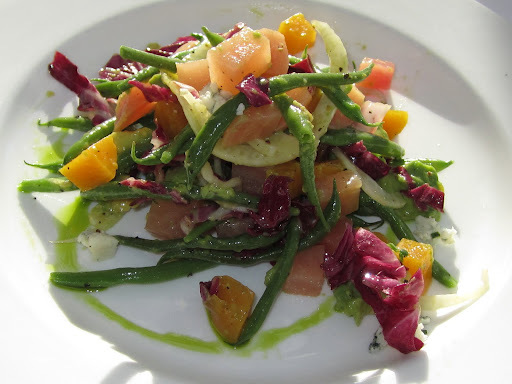 Several people had dined here before and they ordered the beet and haricot vert salad, with a roquefort dressing that was literally fought over by those who had not ordered it! 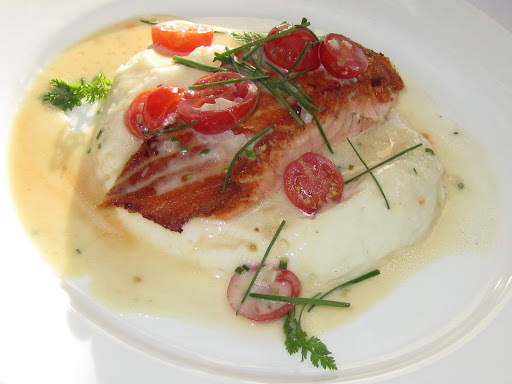 For the main courses, we ordered the seared salmon with buttermilk mashed potatoes and tomato chive butter. 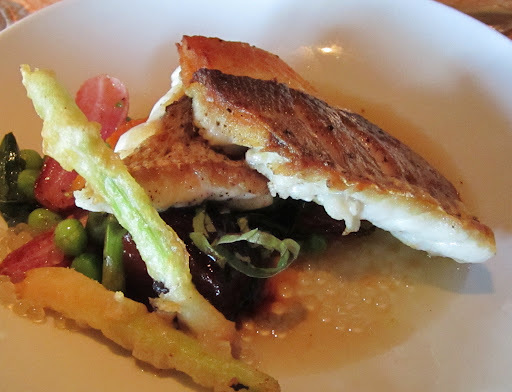 I had to taste this dish to appreciate how delectable the perfectly cooked fish and tangy mashed potatoes were. If you are a salmon lover, this is THE dish to order here! I ordered the spaghetti with clams, which I ordered extra spicy. 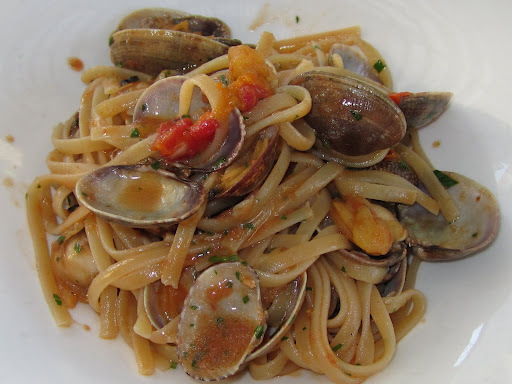 The clams were wonderful and plentiful, and the fresh tomato and garlic were tasty, but even my spicy upgrade was not enough to kick this dish up to extraordinary. It was good and fresh, but the flavor profile was not spectacular. The duck confit with risotto was spectacular. 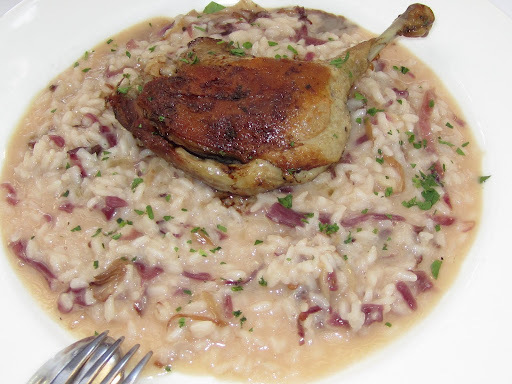 The duck confit was tender and flavorful, and the risotto was done as it should have been to a creamy rich consistency. This was the winner with everyone. The “regular” here ordered the steak ($25) because he said that he rarely orders steak, but loves it here. There is a reason why a non-steak eater eats it here! 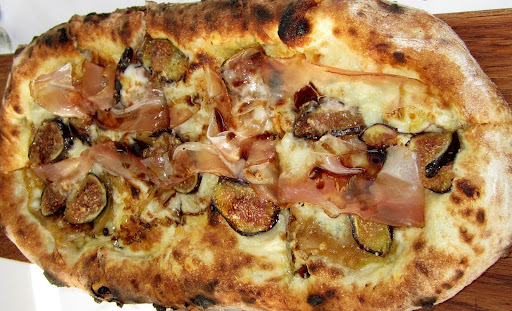 The fig and proscuitto pizza with caramelized onion, gorgonzola and balsamic ($15) was a symphony of sweet flavors which worked well together. 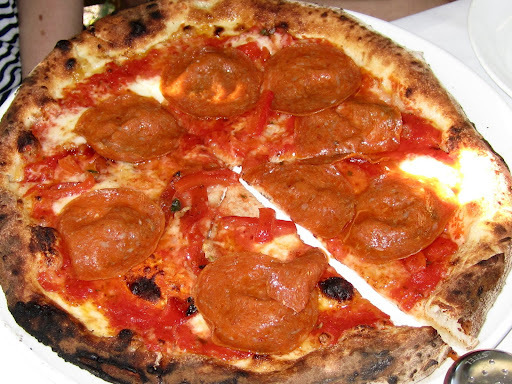 For the non adventurous eaters, there was a standard pepperoni pizza. 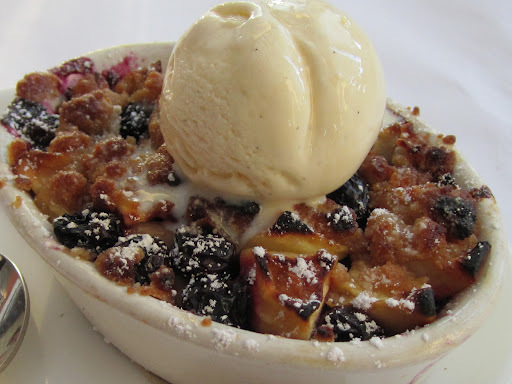 Desserts were universally loved, like the fresh fruit crisp with vanilla bean gelato ($7). 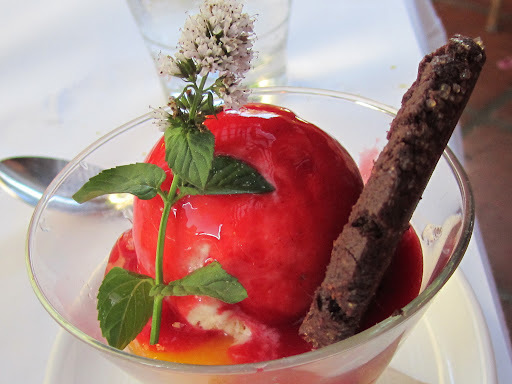 The raspberry gelato with cookie ($6). And last, but not least, the “Bostini” Trifle, with vanilla custard, choclate cake, shipped cream, caramel, and toasted almonds ($9). None of our desserts was finished, not for lack of taste or desire, but we were all stuffed with the contentment great food and time with friends and family. There is no better way to spend a vacation! 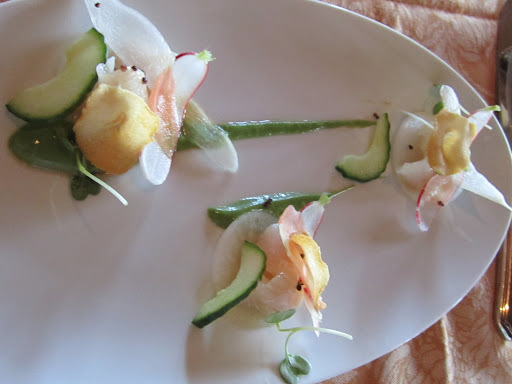 One of the nice perks of staying in a resort is that there are easy dining options. Not all resorts offer good food, but when you find one which offers food as good as the accommodations, like finding a gold nugget in a riverbed, you want to scream, “Eureka”! Thankfully, the Grill at the Silverado Resort had food and service worthy of a five star resort. They are renowned for their week-end brunches which feature an omelette and egg station with a chef who will cook your order on the spot. I opted for the fruit and pastry breakfast. 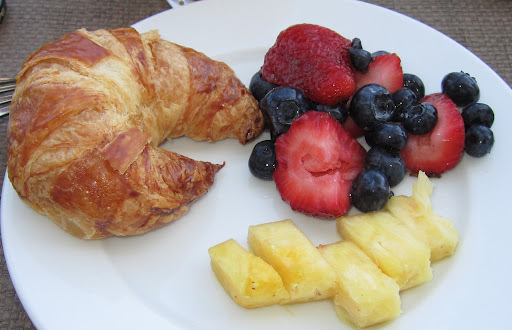 The croissant was decent for a non bakery, and the fruit was ripe, fresh, and delicious (melons were also available). 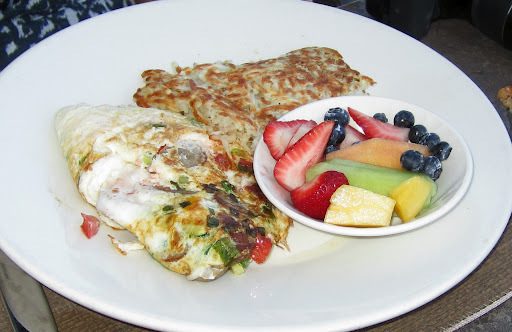 Omelettes can be made with only egg whites, and my friend had egg white omelettes every day of her stay. This day’s special was tomatoes, avocados, onions, and cheese, served with delicious hash browns (crisp and tender), and a side of fruit. 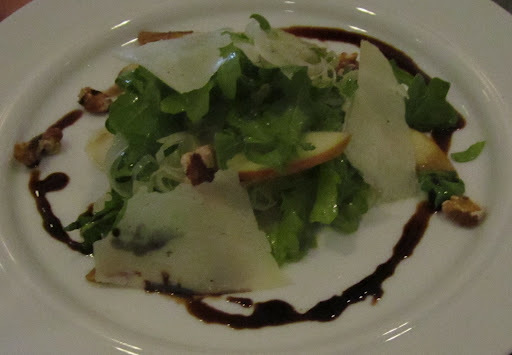 Dinner and lunch options include a salad with roasted hazelnuts, Parmesan, and mixed greens, drizzled with a balsamic vinaigrette. 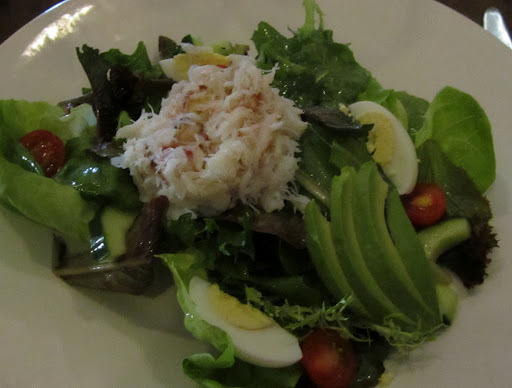 A perfect Crab Louie salad, with fresh crab, avocado, cherry tomatoes, hard boiled eggs, and tender greens. 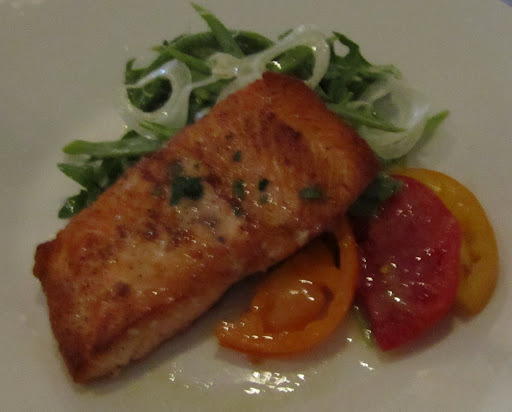 A good rendition of seared salmon served with ripe tomatoes and green salad. 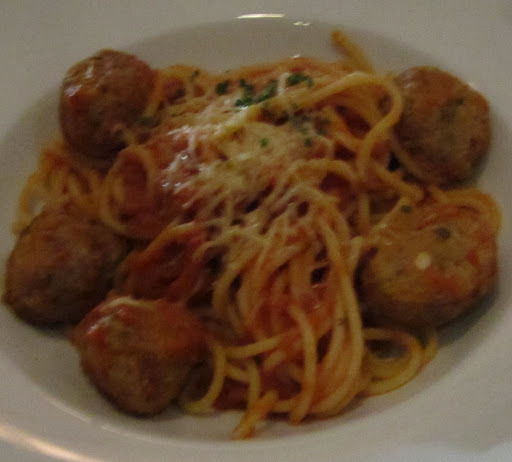 For children, they even offer spaghetti and meatballs. 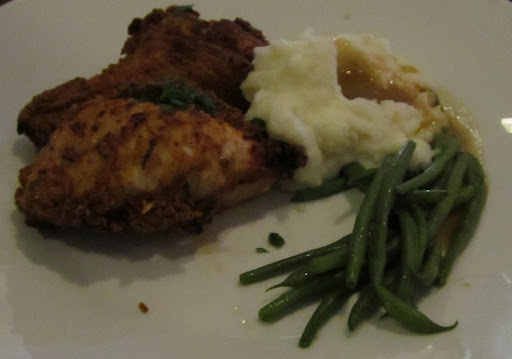 This is a SPLIT order of their buttermilk fried chicken with green beans and mashed potatoes. The chicken was moist and crisp and the sides were comfortingly familiar. 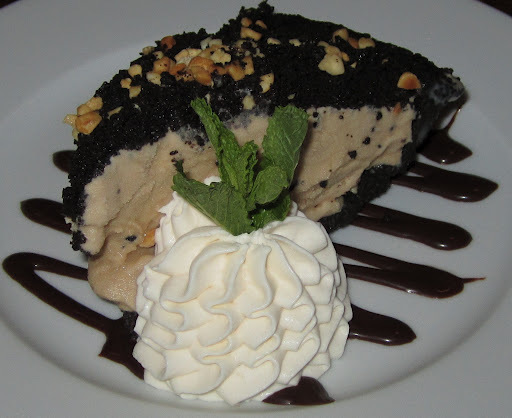 Mud pie was the shared dessert, and everyone who tasted it said it was one of the highlights of the meal. Wonderful wines are offered by the glass (from the region), organic Sumatra coffee and teas are served to compliment the meals, so you can’t go wrong eating at this resort. The fact that the waitstaff had no problem serving a group of 9 adults and 8 children is a testament to their professionalism and great attitude. 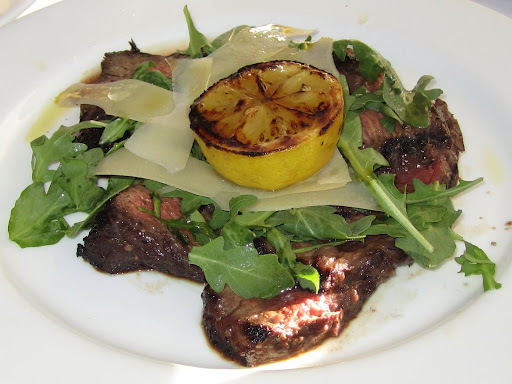 Even if you are not staying at the resort, it is worth a stop to eat at the Grill, especially if you have a large group and even more especially if your group includes children. 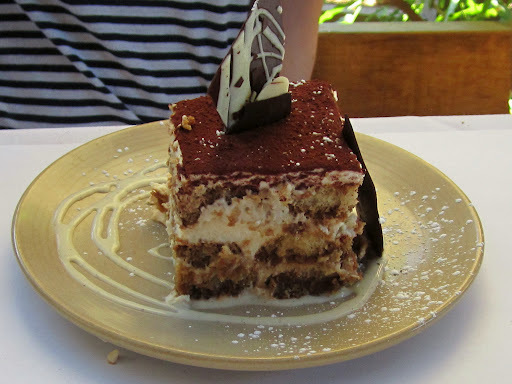 This place has something for everyone from the adult gourmets to the finicky palates of kids. 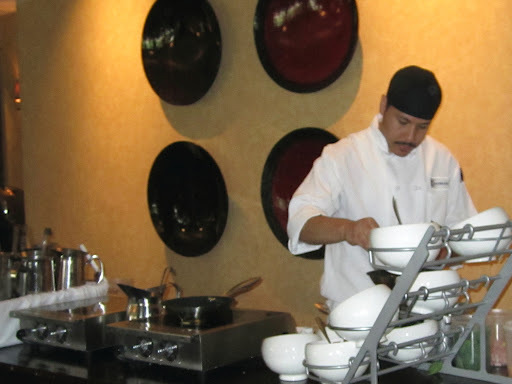 Not many places can serve diverse groups with such grace, but The Grill at Silverado manages to do so with smiles. I haven’t been back to Napa in over 10 years, so when my friends invited me to their family reunion, I looked forward to seeing both my friends from college and wine country. Upon my arrival at the Silverado Resort after an 8+ hour drive, the front desk helped me find my friends by searching last names, first names and relatives names; they never lost their patience or smile. Likewise Dominique, the concierge, managed to reserve a sold out restaurant for a party of four, that became a party of eight an hour before the reservation. Service here was impeccable. Even housekeeping was efficient and smiling with a fully booked hotel, they came and delivered extra towels within 30 minutes of our request. 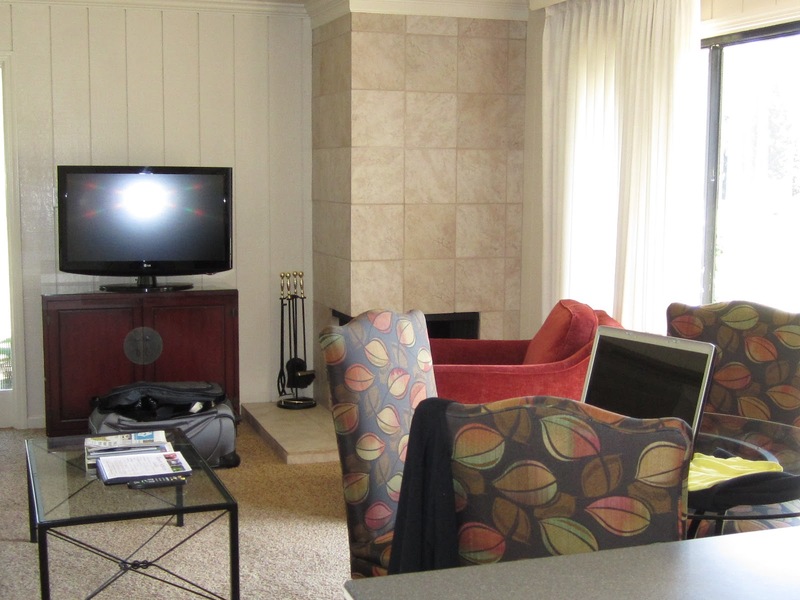 The 1 BR fireplace condo ($340 per night) looked out over the golf course, a beautiful view to wake up to every morning. We got a fireplace condo which was spacious enough to easily accommodate four adults (unless the four are football players). 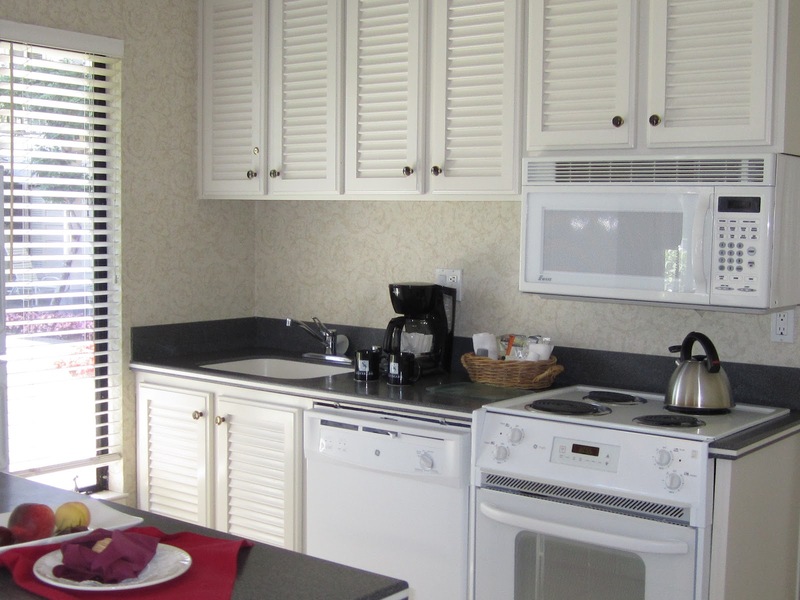 The kitchen was well equipped with a coffeemaker, tea kettle, microwave and dishwasher. 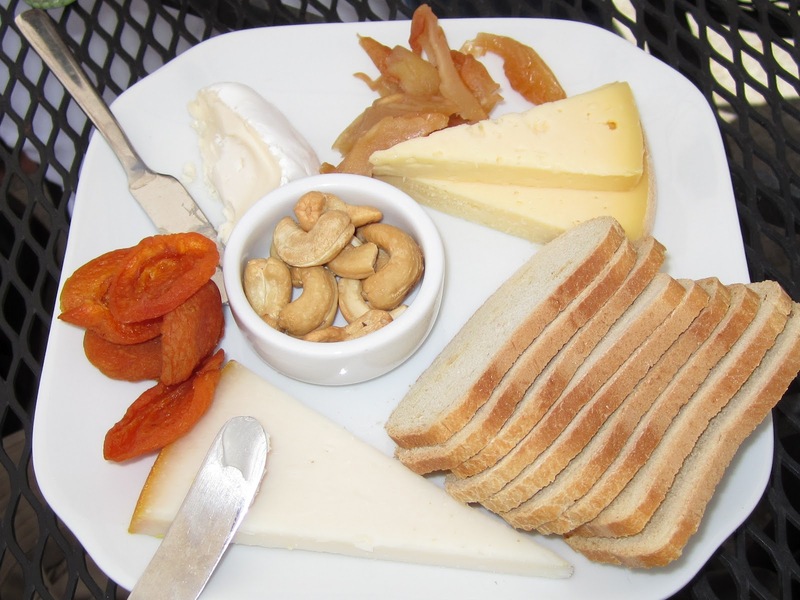 There was a welcome plate of fresh fruit and cheese upon our arrival, which we promptly devoured after a flight which offered NO food (not even for sale)! 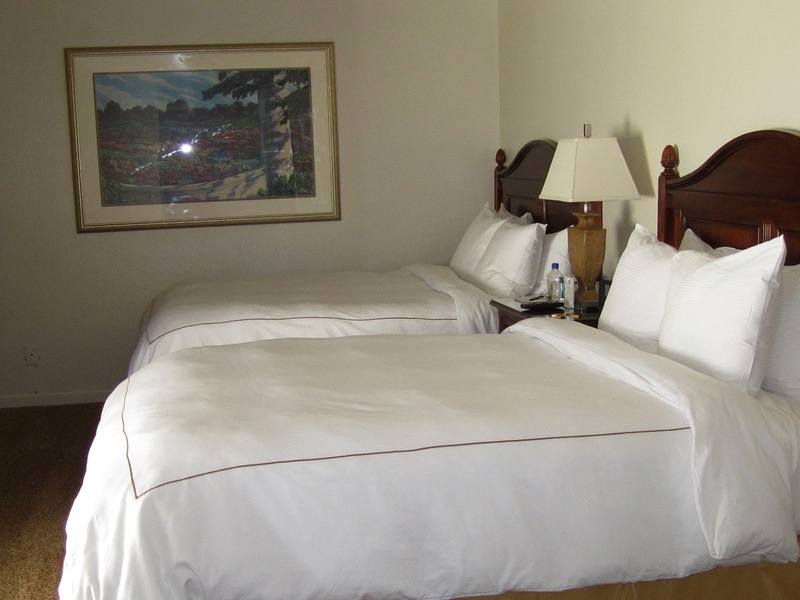 The beds were comfortable and spacious, with mattresses that were neither too firm nor soft. 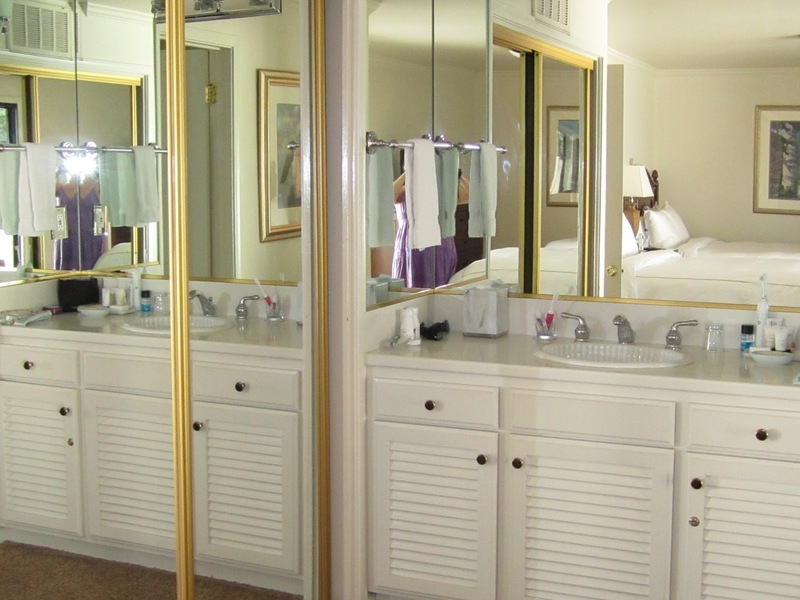 Great touches like a screened bathroom window which opened to a private patio, a full sized ironing board, and a loofah mitt, made this one of the most well appointed places I have ever stayed! The only negatives during my entire stay was that the resort lacked ENOUGH personnel to handle all the guests and the room decor could use a more updated look. The line at the front desk was three guests deep per person at the counter. The lone concierge, Dominique, had 5 guests waiting for her as her phone rang. When I called in to the hotel from my cell phone, I was put on hold and cut off four times as I waited. 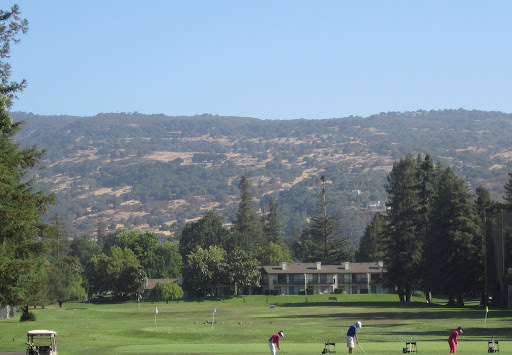 If they would just update the condos to a more modern look and invest in more personnel, this would be a spectacular resort, but it is a very good place to stay as it is now, so if you are going to wine country, consider Silverado as one of the most tasteful choices you can make. 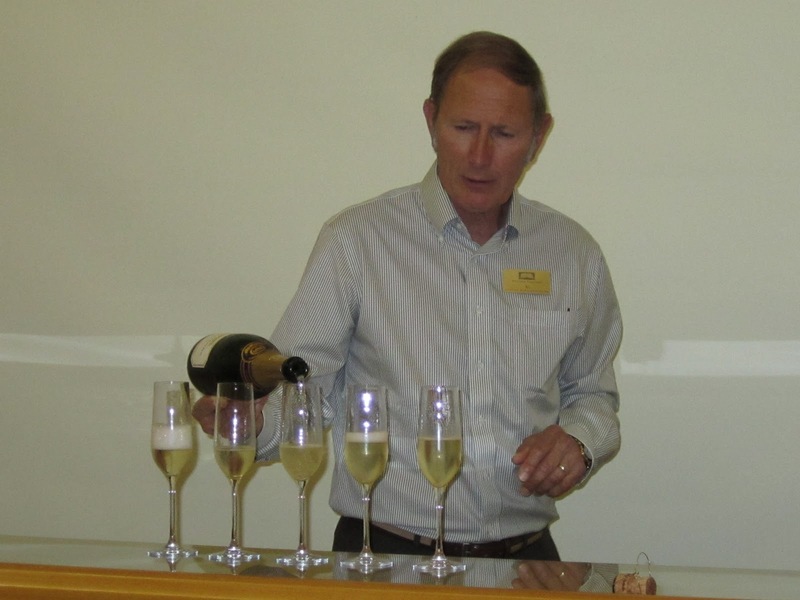 A visit to Domaine Carneros was a sparkling way to start my vacation in Napa! Having met Eileen Crane at Madame Chocolat‘s Decadent & Delicious event a few month’s ago, I couldn’t wait to go to Domaine Carneros in Napa. 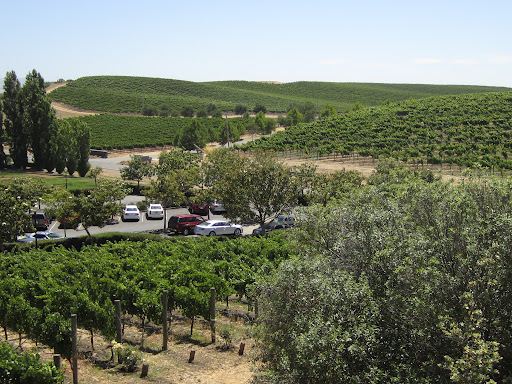 The beautiful property looks out over sprawling hills covered with vines. The tour of the property actually starts in the vineyard with explanations of the soil, foliage, and fruit. 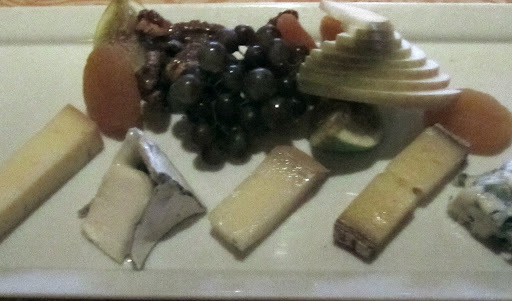 The beautiful Chateau has a large patio overlooking the vines where you can order flights of sparkling wines and accompaniments like this cheese plate. The plates are tailored for the flights you are drinking, so the one we chose complimented the sparkling wines. Psst! 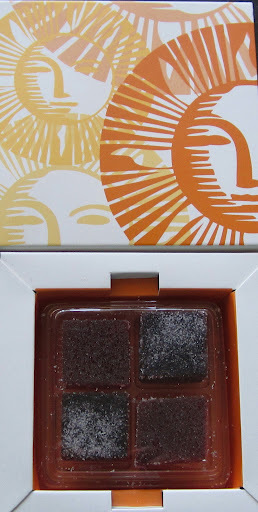 Do you want to literally bathe your love in chocolate? Do you have $570 and 90 minutes? 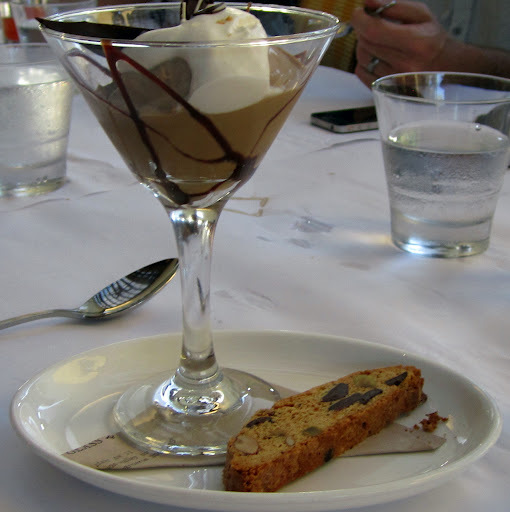 The the Auberge du Soleil in Northern California can make your fantasy come true with a special chocolate indulgence package the entire month of February. 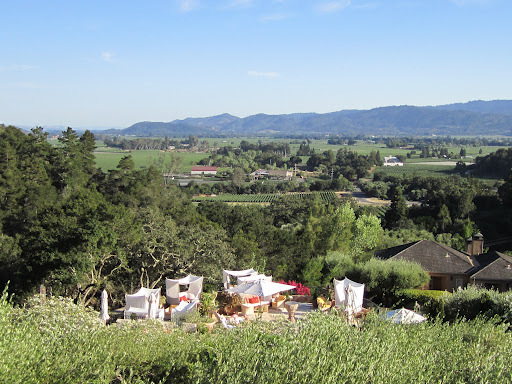 Their spa facility is over 7,000 square feet and has breath taking views of a 33 acre olive grove in Napa reminiscent of Provence, but with all the modern amenities of California like internet access and flat screen televisions. It is a multi-chocolate experience that starts with a cacao and grape seed exfoliation, then a milk chocolate bath for two in a private outdoor garden while indulging in dessert and specially paired wine. And as a sensual “dessert”, you both get a full body massage using a decadent massage oil of chocolate and spice. 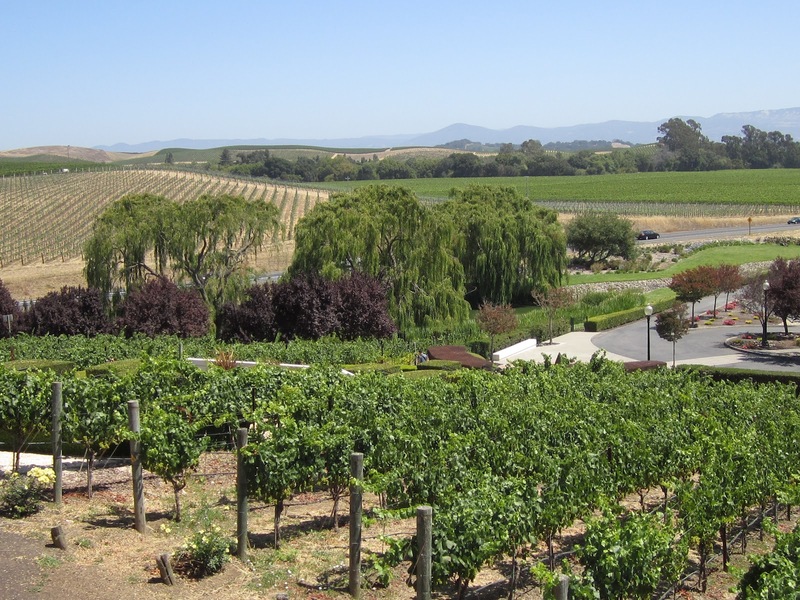 Of course is chocolate isn’t your thing, they have other special packages that include rooms with a view and culinary delights like a four course dinner or wine country limo tour. For the ultimate luxury, indulge in one of the Melissa Suite packages which begin at $2000 and includes three hours in the Melissa Suite with two 120 minute treatments, private use of the hot pool area, a special chef’s plate, and complimentary robes.